Our best-practice, cloud-based HR Operations answers the “do more with less” drumbeat of today’s HR departments. Our end-to-end business process outsourcing services are focused on a positive employee experience. With dedicated, on-shore and tailored call center support, powered by best-practice process standardization, you will simplify and streamline as we manage all, or part, of your HCM functions. Our solution gives you the best standards and processes available in the industry. 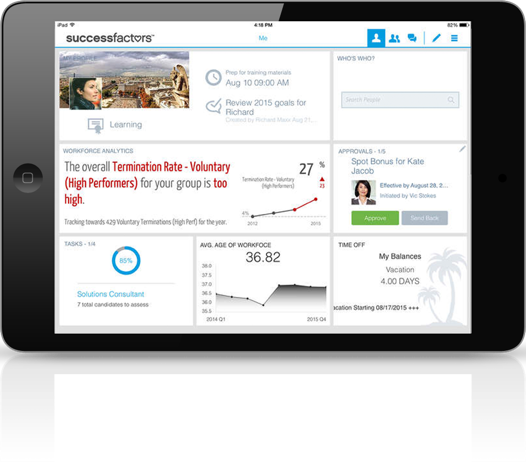 Powered with Success Factors’ Talent Administration, Reporting and Analytics, and Learning Management combined with best in class Payroll, Benefits Administration, Leave Administration, Compliance & Governance, and Time Administration. The best customer experience available. Interactions with onshore industry professionals with HR acumen who are available when you need them. Service delivery advisors who are dedicated to your company only for an industry-differentiating, highly personalized experience. Repurpose your HR assets toward your more strategic endeavors. Enables proactive planning of your HR resources for upcoming service events (e.g. Benefits Open Enrollment, Compensation Planning, etc.) or changes in your business goals. Offerings to keep you on top of the latest industry, legislative and product trends.